Winemaker and GP Doctor Philip Norrie breezed into Glasgow to present a tasting and seminar on his subject: wine and health. 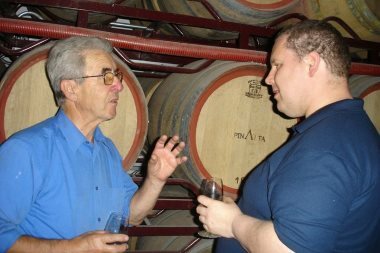 The ebulliant Dr Norrie has written no less than eight books on wine and health and represents a long Australian tradition of winemaking doctors. The founders of Penfolds, Lindemans and Angoves were all medical practitioners who settled in Australia following transportation there to tend to the crew and prisoners of British convict ships. To this day, around 60% of all Australian wine is produced by estates established by doctors. The evening included a highly entertaining slide-show of the history of wine as medicine. Tracing back the connection between wine and theraputic health effects takes us back 5,000 years or so. Ancient physicians such as the Greek Galen, used wine asone of the main ingredient in “galenicals”, one of the earliest families of plant-based drugs. More recent studies have provided firm evidence that wine has very positive health benefits. Dr Kevin Cullen’s 1982 study in Australia found that moderate intake of wine reduced the death rate from coronary thrombosis by up to 50%. Wine is found to raise HDLs (basically the good form of cholesterol) and lower LDLs (bad cholesterol). It is a powerful antioxidant, two or three glasses per day affording 100% antioxidant protection and guarding against cancer-forming damage to cells. Various high-quality independent studies have found wine to reduce chances of dementia, osteoporosis, gallstones, strokes, H.pylori, deep vein thrombosis and high blood pressure. Furthermore, Dr Norrie believes that white wine is just as effective as red, largely based on the fact that though red may contain more of the beneficial compounds than white, a state of 100% antioxidant protection is acheived with a few glasses of either. And so on to wine. The Pendarves Estate is in the Lower Hunter Valley, situated on the “Belford Dome of Limestone”, giving it a fairly unique soil in this area. The estate is small at only 30 acres, but quite a range of varietal wines are produced including Chambourcin, a hybrid grape from the Loire, only permitted to be bottled as a varietal for import into the EU within the past month or so. For me, it was the most intersting of Pendarves’ red wines on tasting. Their Verdelho is one of the best I have tasted from Australia, and came from a drought year, 1998. The Scottish agency for these wines is Alexander Wines (0141 882 0039) and they are retailed by the Peckhams chain in central Scotland. Pendarves have a website at www.pendarves.com, and Dr Norrie has a wine and medicine website at www.winedoctor.md. The tasting was not blind. Pale straw/green. Attractive nose of marzipan, lime, apple and more luscious nuances of passion fruit, ripe melon and guava. The palate has good weight and a certain oiliness. There is a lovely lime quality to the fruit and acidity, the edge taken off by a hint of butterscotch. The powerful finish is dry, with pithy acidity and spice. Very good indeed. Given only six months in oak, this wine has a surprisingly deep golden colour. There is a distinctive quality to the fruit on the nose, which has fig and quince, apricot and peach kernel with gentle cream and vanilla notes. It is very reminiscent of Hunter Valley Semillons, so is this a quality of terroir? On the palate it is perhaps lacking a little acidity, coming across as slightly hot and alcoholic, but there is good, ripe, buttery fruit of melon and peach. Good length, and a nice wine drinking now. Medium/deep ruby colour. Quite bright raspberry and red cherry fruit, higher notes of camphor, liquorice and mint. Floral notes too. Rather harsher on the palate than expected, with slight stalkiness and firm tannins adding to a rather lean character. Quite long, but then highish acidity clamps down. The Chambourcin is a Loire hybrid (so at least one of its “parents” is not Vitis vinifera) quite common in the Western Loire, but never bottled as a single varietal. It was also illegal under EU legislation until very recently, so those few Australian producers who have planted it are only now begining to ship to the UK. The colour is a very healthy deep crimson/black. The nose is very spicy and berry-scented with plum, leather and slightly gamy notes. On the palate it reminds me very much of the Baco Noir from Canada (another hybrid) with warm, juicy berry fruit, a touch of earthiness, plenty of gutsy spice and decent length. Not terribly structured or fine, but really very tasty and delicious. Worth trying if the price is right. Dark, vibrant crimson. Nose of sweet violets and cherry, spice and pepper. Blackcurrant nuances beneath too. Palate has plenty of spice and power, but there is raspberry, some herbal notes and a solid underpinning of damson and dark cherry fruit. It is medium-bodied and quite savoury with decent length and drying tannins that dominate the finish. Good.